On the day that Len Bias would have turned 50, it is worth remembering how people have used his memory and exploited his death. November 19 marks what would have been the fiftieth birthday of Len Bias, the University of Maryland’s galactically talented power forward who died at the age of 22 of a heart arrhythmia related to the ingesting of cocaine. His death came two days after being picked second by the Boston Celtics in the 1986 NBA draft. Never in the history of sports has so much potential been extinguished with such swift cruelty. Athletes and other cultural figures in the prime of life have died before and since. 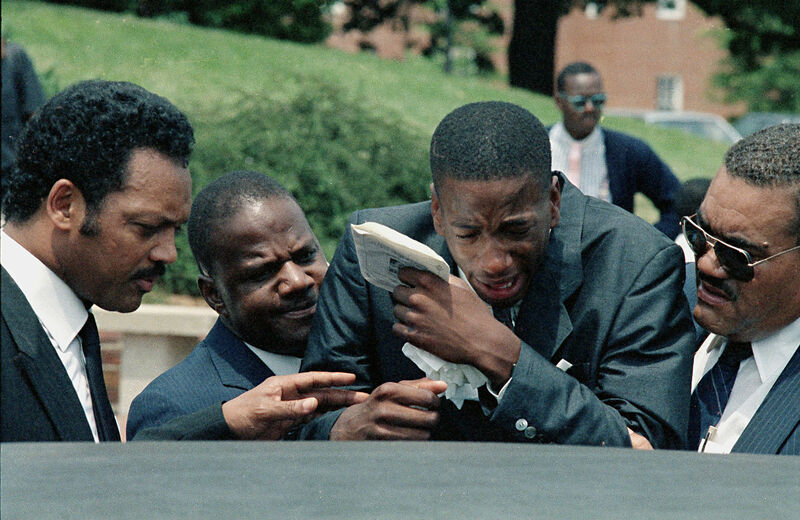 But the memory of Len Bias still has the power to make grown adults feel numb like it’s happening all over again: a moment where the world as we knew it changed and something we did not even identify as innocence died in an instant. Understanding the impact of Bias’s death starts by understanding Bias on the court. His abilities were magnetic. Bias was the genetic splicing of Doctor J and Charles Oakley: a high flying, muscle bound, talent who made you feel like you were watching a sneak preview into the game’s future. During his time in the ACC, it was common to refer to Bias as the most physically gifted player in the conference: the second, being that kid from North Carolina, Michael Jordan. Take a moment, watch these highlights and just notice where Les Bias’s head resides, relative to the rim. This was simply something we had not yet seen. For basketball lovers, his death was the asphyxiation of a limitless potential, and to quote Bethlehem Shoals’ words on Lebron James, “an American Dream that most of us are too bashful to even dream of.” Now that I live fifteen minutes from where Len Bias went to college at UMD and ten minutes from his High School, Northwestern, I have also learned that his death crushed the heart of an entire community. Len Bias was the kid from Landover who never left Prince George’s County, one of the most vital majority African-American regions in the country. PG County is the only municipality in the United States that went from majority white to majority black while rising in per capita income and education. Len Bias was not only going to rep that to the world, he told everyone that he would be bringing them along for the ride. The shock of Len Bias’s death is the only way to understand how, after one tragic night, he became a one person “shock doctrine”, and inexorably changed the conversation of how the United States dealt with illegal drugs. “The shock doctrine” is Naomi Klein’s theory about how “shocks” like tsunamis, earthquakes and hurricanes open the door for radical right-wing reforms that people would reject if they were not in a state of mental disarray over the destruction of their lives. Len Bias’s death had a similar effect. Masses of people were inclined to agree. The problem was that Nancy Reagan’s “anti-drug efforts” involved a shift toward criminalizing the poorest sections of our cities. Instead of speaking about drug addiction as a medical issue, it became a criminal justice issue. Instead of selling drugs being seen as an economic survival imperative of communities left behind by the “Reagan Revolution”, it became seen as an act that demanded a military response with those on street corners seen as enemy combatants. And no one wanted to talk about how the drugs came into the communities in the first place. It might be hard for people under 25 to even understand our ignorance and fear, but we really thought that there would be graveyards of people, from little kids to star athletes, dying after their first snort of cocaine or their first puff of crack, and there was federally approved school curriculum carrying that very message. In 1988, the US Congress even passed the bi-partisan Anti-Drug Act, known as “The Len Bias Law.” It created more mandatory minimums for drug offenders, expanded police arresting powers, and poured more money into the DARE program at schools. I remember DARE and being told about my duty to turn in my parents if I ever saw them with “illegal drugs.” Fortunately for them, I never caught them because at age 11, with Len Bias’s death on my mind, I think I was ready to do it. We seem to be waking up from this nightmare, at least rhetorically, but even with more people recognizing that the expansion of the prison system to swallow non-violent drug offenders has created a “New Jim Crow” and even with more states adopting more sane approaches to marijuana, the war on drugs plods along. Today in the DC area that Len Bias called home, black men are eight times more likely than whites to get stopped and arrested on suspicion of marijuana possession. Len Bias’s death was an unspeakable tragedy. What people in power have done with his memory has metastasized that tragedy beyond comprehension. Liliana Segura asks why non-violent offenders should face life in prison.